Scroll below for links to conservation planning resources, methods and tools developed or used by Applied Conservation. Shown to the right is the Health Summary scorecard from the turboCAP software, available via link in the section below. Landscape-Scale Conservation, A Practitioner’s Handbook. A 57-page how-to handbook (PDF file) on the ingredients of effective landscape-scale conservation action, including the key elements and tools of Conservation Action Planning (CAP). By Greg Low. 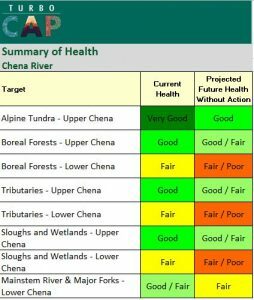 Conservation Action Planning – 2 Page Summary. Conservation Action Planning (CAP) is a relatively simple, straightforward and proven approach for planning, implementing and measuring success for conservation projects. CAP was developed and refined over 20 years by Greg Low, Dan Salzer and others at The Nature Conservancy, and has been applied at over 1000 conservation projects. Are We Conserving What We Say We Are? Seminal article in Bioscience that has provided a foundation for CAP — identifying the key ecological attributes of every focal target, defining what constitutes viable condition, and providing metrics to rate their current condition. CAP Excel Workbook. Free software to support project teams developing a credible first iteration CAP. This original Nature Conservancy version (no longer supported) runs off Microsoft Excel but is programmed in Visual Basic with tables, forms and “wizards.” Applied Conservation uses this software instead of Miradi, among other reasons because it better supports and features the viability or health assessment described in the Bioscience article above. 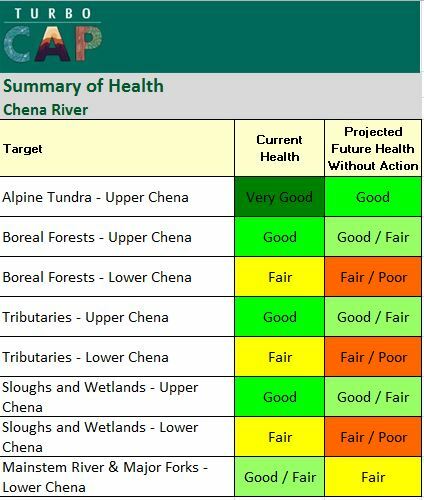 The first version of turboCAP was used with the Tanana Valley Watershed Association and partners to develop a Watershed Resource Action Plan (WRAP) for the Chena River Watershed in Alaska. The plan’s results are reflected in the example workbook: turboCAP Excel Workbook – No Macros – Chena River. A newer version of turboCAP was used to support the CAPs for three marine conservation areas on Maui, and a beta-test version of the software is now available at https://sites.google.com/view/turbocap/home. Instructions, hints and worksheets for completing a “credible first iteration” CAP using the turboCAP approach are under development and partially available on the website. Landscape Forecasting – Journal of Conservation Planning. Article by Greg Low, Susan Abele and Louis Provencher on “Enhanced Conservation Action Planning” (aka Landscape Conservation Forecasting), featuring case study application working with BLM in the Bodie Hills, California. Forecasting the Benefits of Conservation Strategies to Land Managers. Keynote Powerpoint presentation (PDF file) on landscape conservation forecasting applications by Greg Low at June, 2011 ecological modeling conference in Portland, Oregon. LANDFIRE Ecological Models. The interagency LANDFIRE program developed ecological models to represent pre-settlement conditions for all terrestrial and riparian ecological systems in the United States. Each ecosystem model consists of (1) a quantitative state-and-transition model and (2) a description document. Use and adaptation of these models is a key element of Landscape Conservation Forecasting. Available at no cost from LANDFIRE — select a mapping zone to download model products for the U.S., including model descriptions and ST-Sim model database. ST-Sim Modeling Software. A new version of vegetation modeling software that uses the state-and-transition model approach (originally available as VDDT) is available as a free download from ApexRMS. Conservation Gateway. Link to Nature Conservancy website which provides varied information and reports on Landscape Conservation Forecasting.